﻿The ﻿Democratic ﻿Candidate ﻿for ﻿United ﻿States ﻿House ﻿of ﻿Rep. ﻿in ﻿District ﻿22. ﻿Guest ﻿Speaker: ﻿Diane ﻿Trautman, ﻿The ﻿Harris ﻿County ﻿Clerk ﻿come ﻿listen ﻿to ﻿her ﻿ideas ﻿on ﻿countywide ﻿voting ﻿centers ﻿and ﻿how ﻿to ﻿improve ﻿voter ﻿turnout. ﻿Guest ﻿Speaker: ﻿Rhonda ﻿Hart; ﻿the ﻿mother ﻿of ﻿Kimberly ﻿Hart ﻿who ﻿was ﻿killed ﻿in ﻿the ﻿Santa ﻿Fe ﻿High ﻿School ﻿shooting. ﻿Rhonda ﻿Hart ﻿has ﻿become ﻿an ﻿activist ﻿committed ﻿to ﻿gun ﻿violence ﻿prevention. We stand together in support of each other for the protection of our constitutional rights, health, environment, immigrants, and uphold the belief that vibrant and diverse communities are the strength of our country. We stand together in support of one another for the protection of our constitutional rights, health and environment and uphold the belief that vibrant and diverse communities are the strength of our country. The name of the organization shall be the Bay Area Democratic Movement. To support and promote Democratic principles at all levels of government. To exert influence on the Democratic Party to continue its historic role as a party which promotes social justice, the local, state and national interest, and the needs of all people. To keep the Bay Area Community informed of the Bay Area Democratic Movement and its principles by concentrating activities primarily in the Clear Lake and surrounding areas in cooperation with the Harris County and Galveston County Democratic Party and those elected or appointed Democratic Precinct Chairs in these precincts. All persons at least age fourteen (14) who are interested in the political process and support the principles of the Bay Area Democratic Movement are eligible for membership in the organization. Membership dues shall be set by the Executive Committee, approved by the general membership, and made a part of the by-laws. Membership dues shall be paid annually, due in February each year and pro-rated for new members. Only members in good standing shall be eligible to vote. The term of each office shall be 2 years, beginning May through April. No term limits will be in place. Elections shall be held at the regular April meeting of the organization. The President shall preside at all meetings and be the official spokesperson for the Executive Committee and for the organization. The President shall create committees as needed. The President shall have the power to call special meetings. The President shall be the official spokesperson at all meetings or gatherings with other Democratic organizations, Democratic officeholders and/or candidates seeking office. The Vice President shall preside in the absence of the President. The Vice President shall additionally be responsible for arrangements of membership meetings and programs. The Secretary shall keep the minutes of all meetings and be prepared to report those minutes at the next scheduled meeting if requested by the President. The Secretary shall make such records available to all officers as requested. The Secretary shall additionally be responsible for coordinating publicity for the organization through newsletters and/or in the media. The Treasurer shall receive and deposit all moneys of the organization and shall record all financial transactions and report them to the Executive Committee for the general membership. Membership dues received by the Treasurer shall determine active membership status and the Treasurer shall supervise the accuracy of membership records. The Treasurer shall additionally be appointed by the Executive Committee to be the Treasurer of the Bay Area Democratic Movement Action Committee and be responsible for filing all reports required by law with the Texas Ethics Commission. The Bay Area Democratic Movement will meet at least quarterly. Special meetings may be called by the Executive Committee. A quorum comprised of a minimum of four (4) members shall be required to conduct business. The annual meeting to elect offers shall be held in April. This Constitution may be amended by a two-thirds vote of the members present and voting as a meeting, provided the proposed amendment has been read as a proposed amendment at the previous meeting. Bylaws shall be adopted by a majority vote of the members present and voting at a meeting. The most current edition of Roberts Rule of Order, Newly Revised, shall govern, unless otherwise provided in this Constitution or Bylaws. This Constitution and Bylaws shall take effect upon adoption by a two-thirds vote of those in attendance at a mass meeting of the membership. If, at any time, this club shall be dissolved, no part of the funds or property shall be distributed to or among its members, but after payment of all indebtedness of the club, its surplus funds and properties shall be donated to the Harris County Democratic Party. Students (high school and college) and seniors (65 and older) are exempt from dues. Come join Bay Area Democratic Movement and have some fun while staying informed, learning and being active in the political process. Dues are $25 per individual and $35 for a family membership. Students and individuals over 65 are free. We meet the second Tuesday of each month, with the exceptions of January and July, to discuss current events and organize for Democratic Party candidates and progressive causes. Please come and join like minded Democrats in the Bay Area and consider joining our club to promote Democratic principles and help us elect Democrats. Cash or Check. Credit cards coming soon! $25/Member, $35/Family, Students and 65+ are at no charge! Donations to help establish the club and pay for our website and campaign materials would be greatly appreciated! K R I S T L A W F I R M, P.C. Kim Krist graduated from the University of Texas in Austin with a BA in Marketing and worked in the retail industry before switching gears and becoming a teacher. She now works at Bright Futures as an Educational Consultant. She is married to Scott Krist and has 2 children who currently attend the University of Texas in Austin. Kim's hobbies are tennis, hiking, and running but her passion is politics and is a political news junkie. She started the Bay Area Democratic Movement with a group of girlfriends right after taking part in the 2017 Women's March. Kim is also a Precinct Chair for district 568 and believes in the power of individuals to make a change. John joined the Democratic Party in the early 90's and joined Clear Lake's local club, Bay Area New Democrats. Later he served as Vice President and then President of the club. John worked as the volunteer coordinator of the Sherrie Matula campaign in 2008 and worked closely with the campaign. He did his share of phone banking and block walking. In the past John has been an advocate for consumers in the area of home building issues, electricity rates, and home insurance. John has testified at many hearings on consumer issues in Austin and hopes to resurrect his activism after retirement. He is excited to have been asked to serve at Vice President of BADM. Angie Berka is the Director of Finance & Administration at Houston Mechatronics and holds an MBA from University of Houston. She is happily married to Reg Berka and they have three grown children, Allicyn, Ben & Corynn. Angie is excited to be a part of the Bay Area Democratic Movement. Like many democrats in the country, Angie was concerned about the direction of our country after the election in November 2016 and, as a result, she chose to get more involved and active. She participated in two marches in 2017, the Women’s March in Austin (her first march ever) and the Science March in Houston. Angie has worked closely with Kim Krist and the other Board Members to build the Bay Area Democratic Movement and grow membership. She has also assisted with Dayna Steele’s campaign for District 36 through phone banking and block walking. Angie is ready for the Blue Wave in Texas. Get out and vote! Tracey Lewis is a retired Labor and Delivery Nurse and holds a BSN, RN from The University of Texas Health Science Center and a BBA with a concentration in Management Information Systems from The University of Houston. Nursing was a second career after spending over 25 years in the Information Technology field. She is happily married to Steve Lewis and has two children, Leon and Emma. Tracey’s hobbies are traveling the world with her wonderful husband, and seeing live music with her friends. Tracey has been a democrat all of her life and has voted in every presidential election and most primary elections since she was 18 years old. After the 2016 presidential election, Tracey became active in trying to change the direction this country is heading. Tracey has participated in marches and actively supports local and national candidates, both financially and as a volunteer. Serving on the Bay Area Democratic Movement board is the first time Tracey has become actively involved in politics and feels it is an honor and a privilege. Carla Medlenka has been an entrepreneur much of her life, working mostly in communications, journalism and publishing. She joined the corporate world four years ago and currently works in health care marketing. Always politically aware, Carla has voted in every presidential election since she turned 18. Then, the 2016 election shifted her casual political attitude. She marched in Washington DC at the first Women’s March and has been an outspoken Democrat ever since. She is a founding member of the Bay Area Democratic Movement and now engages in as much political activism as she can squeeze into each day. Carla has been married to Galen Medlenka for 30 years and they have three grown children (but no grandbabies - yet). Nina Johnston worked for the Atlanta Journal and Constitution in marketing research as well as at the Houston Chronicle as Senior Research Analyst, before moving into the National Sales Manager role there. After leaving the corporate world to raise her two boys, Nina has dedicated herself to volunteer work. She created and developed a Children Around the World festival for the Montessori school, a fundraiser which continued for about ten years. She was one of many activists who organized at the grass roots level to save the old Clear Lake Golf Course (now Exploration Green) from development. She worked in the early days of that effort as the public relations contact in a media battle for accurate reporting of the facts about the land use for flood control. It was a real life David and Goliath fight, and a true testament to what our community can do at the grass roots level to stand up for what is right and true. Since November 2016, Nina has devoted herself to political activism and community organizing. She is serving as Precinct Chair for Oakbrook (#745), as a member of the Senate District 11 Precinct Chair Vacancy committee, and is the Precinct Captain for precincts 692, 416 and 742. She is also serving on the board of Bay Area New Democrats (BAND) as Secretary. 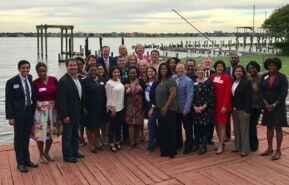 It is a great pleasure to work in the Harris County Democratic Party, and with all the tremendous people who are getting involved to turn Texas BLUE!! Samuel Alix is a native Houstonian. After completing 22 years in the military and serving as both a civilian and military police officer, Sam co-founded a veteran non-profit program, Changing Hearts and Minds Program(CHAMP) with his wife Kayla. Sam is committed to advocating for others, spreading positive vibes, and serving ALL members within his community. Kayla Alix is a native Houstonian who grew up in South Park Houston and attended Ross Sterling High School. She received her degree in Business Information Systems and recently obtained her Masters Business Administration. She is married to Samuel Alix a disabled Veteran, and together they have five children and three grandchildren. Her career in Information Technology began in 1998 which catapulted her fulfilling her passion of working with youth attending under parish schools in the areas of Science, Technology, Engineering, and Math (S.T.E.M.). Kayla is also the co-founder of Changing Hearts And Mind Program (C.H.A.M.P.) a non-profit that assists military, veterans, family members, and caregivers to receive many services such as Mental Health, Wellness Recovery, and benefits. Sam and Kayla founded their organization after similar struggles they shared when Samuel returned home from Iraq. Kayla is passionate about equality amongst all people and the opportunity for education for all who chose to pursue their goals. TEXAS DEMOCRATIC CANDIDATES FOR THE WIN !